Well, duh! But I had to include this lest someone leave a smartass comment chiding me for leaving it out. You know who you are. This helps them heal faster and keeps them protected from the elements. Obviously, this won’t work for deep cuts, but it’s great for little cuts like if you cut yourself shaving. It will also keep dirt and other things out thereby reducing the chance of infection. In extremely cold weather, rub it on exposed skin to help prevent frostbite. Chap stick can also be used as sunscreen. It’s not as effective as regular sunscreen, but it will do as long as you’re not in the sun all day. Just don’t get any in your eyes! If there’s a spot on your skin that is getting rubbed raw, put some chap stick on it to prevent a blister from forming. If you’re in a bright desert or snowy area, dip chap stick in black ashes and rub it under your eyes. This will keep you from going snowblind. Rub it on q-tips, cotton balls, lint, cloth, gauze, or even dried bark to make tinder that catches fire easily. Cut a q-tip in half, rub the cotton end on the chap stick, then turn it over and stick the other end into the chap stick and you’ll have a small candle. It won’t burn all evening, but it is a good temporary candle that will make it a lot easier to get a fire started. The bearing block needs to be lubricated so the spindle will spin more easily. If nothing else is available, chap stick will do. I’m talking about the ones on metal twist caps or outdoor light bulbs. This will prevent them from rusting. This will make them easier to move and make them a little more water resistant. Any tool with moving parts and friction can benefit from chap stick. Also, if you put it on screws and nails it will be easier to drill or hammer them into place. Just rub it directly onto the blade. Very helpful if you’re on the move and it’s raining. If you have any tiny holes in your poncho or tent, a little chap stick will plug it up. Rub it all over anything leather such as a sheath or shoes. This will protect the leather and make it somewhat waterproof. Rub a dab of chap stick all over the lens then polish with a thin cloth. This will clean the lens and keep them from fogging up. If your hands swell up, rub chap stick on your fingers and the ring will slide right off. Take off the caps on both ends, clean it out really well, then roll up some cash and stick it in there. Great way to hide money. Several little things can fit into an empty chap stick tube such as pills, a tiny compass, a q-tip (for kindling), strike-anywhere matches, steel wire, the tip of a pen for writing, piece of an X-Acto knife, a hook and fishing line, etc. 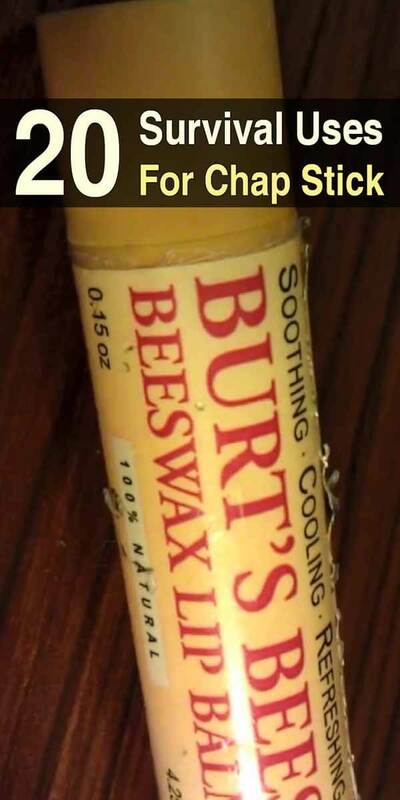 Any type of lip balm / chapstick will do, but I prefer Burt’s Bees Lip Balm. There is another thing you could do. Instead of using the wax itself, you could use the cap as a sort of lantern in conjunction with a AAA battery operated flashlight. Take the cap of and insert it at the front of the flash light. This will diffuse the light creating a mini lantern. You could also keep the caps in different colors of the lip balm tubes. Green, Red and the normal white ones; making it it possible to create a lantern with different light depending on the situation you want to use it for. In a summarised nutshell, eliminating waffle and saving time…(1) first-aid, (2) fire / light, (3) clean, (4) lubricate, (5) protect, (6) contain and/or hide /disguise. Why do folk waffle?? A great use for lip balm is for sticky drawers, just rub the bottom runners on the drawers with the balm and they slide in so easily. This also works for the side runners, metal or wood works equally well..
Burt’s Bees is an incredibly expensive way to accomplish these things. It’s very easy to make your own; all you need is some beeswax pellets (available online), coconut oil or shea butter (ditto), and essential oils if you want it to smell nice. Empty lip balm tubes are also available, or you can put it into little jars (like the ones jams and such come in, in gift baskets.) Melt a couple of Tbs each of beeswax, shea butter or coconut oil in a 1 cup Pyrex measuring cup sitting in simmering water, stir gently to combine and take off the heat. Let cool a little, then add a few drops of EO, if desired. Pour into tubes or jars and let cool. You can make several dozen of the tubes for the price of just a few store-bought ones. You can also adjust the softness or hardness by changing the ratio of beeswax to the other ingredients. I’ve kept mine in the car console in the summer time with no melting problems. So TRUE! Thanks, Grandma. I am continually tempted by attractive packaging, but the fact is, I have everything I need for making pretty much everything. I made that my goal about six years ago. It is the only way to go. I couldn’t help but laugh at this, don’t get me wrong all good tips it just I went to grade school with this kid who used to eat chapstick all the time, he couldn’t help himself and cherry was his favorite lmao. Number 4 is not true. DO NOT use any lubricant if there is very cold or you sure get frostbite. Been there done that.